Want to prevent apples, bananas, and other fruits from turning brown? It only takes one ingredient! A few months ago I brought sliced apples over to a friend’s house and they were perplexed as to how and why they hadn’t turned brown. I thought everybody knew the trick on how to prevent cut fruits like apples and bananas from turning brown, but I was wrong! As it turns out, the little trick I’ve used all along isn’t as well-known as I thought and yet it’s so easy! I cut multiple apples at a time, use this little trick, and keep them in the fridge for days! Of course it’s best to eat certain fruits as soon as possible after cutting them, but it’s so helpful to know how to prevent fruit from turning brown. 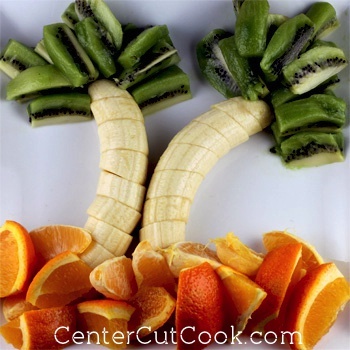 If you want to make it yourself, you’ll need 2 oranges, 2 bananas, and 4-5 kiwi fruits sliced. Any time you cut fruits like bananas, pears, and apples that you don’t want to turn brown, simply squeeze some lemon juice over them. You can use fresh, or bottled lemon juice (which I usually have on hand). No need to measure a certain amount, just squeeze a generous amount over the fruit and toss the fruit to coat. Make sure to cover the fruit tightly with plastic wrap, or place it in an air-tight container until you are ready to eat it.